The Northfield Glass Centre supplies all types of safety glass for all safety and security requirements. Laminated glass is designed to hold together when smashed or even shattered. Two or more layers of glass with tough polyvinyl butyrain (pvb) layers between ensure that there is minimal break up under impact. Balcony glazing and stair sidewall supports. Glass table tops and furnishings. Toughened glass is up to five times stronger than ordinary glass at the same thickness. The increased strength of toughened glass allows architects and builders much greater scope in their use of glass. It meets worldwide safety standards for glass subject to accidental human impact at the highest severity levels . 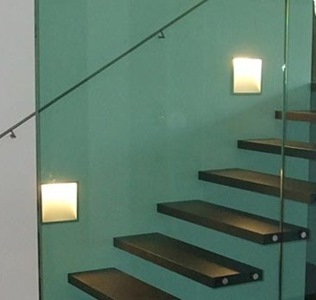 Wherever the benefits of ordinary glass need to be combined with extra strength, safety or heat resistance, Toughened Glass can offer a complete and proven solution. Use Architectural Glass with Confidence! Northfield Glass Centre can install Safety Glass according to the latest planning legislation. We can also supply the full range of toughened and laminated safety glass to the trade. 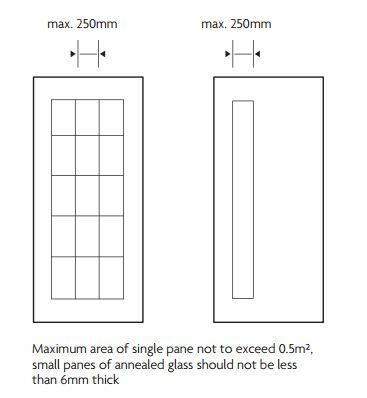 We have included these extracts, below to help you plan your use of glass to meet the design briefs in your architectural projects. c) Be shielded or protected from impact. b) Between floor level and 1500mm above that level in a door, or in a side panel with 300mm of the door. 2) Toughened (tempered) glass – Thermally toughened glass is comparatively difficult to break. If broken it will fragment into very small comparatively harmless pieces. This reduces the likelihood of the glass breaking in a dangerous way, but does not remove the risk entirely. 3) Glazed in small panes – Either as a single small pane or a series of panes. 4) Given permanent screen protection – So that the glazing is installed behind a protective screen. c) Be difficult to climb. Glazing that is afforded permanent screen protection, does not itself, need to comply with the requirement. Four to five times harder to break than ordinary annealed glass, and if it breaks it does so safely by disintegrating into thousands of very small pieces with dulled edges. 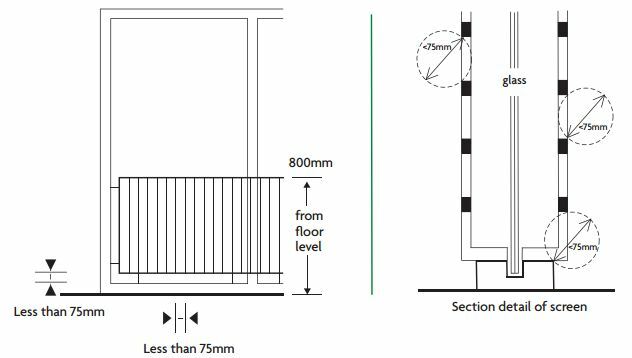 The normal thickness of 4mm is what is commonly used in most sliding patio doors and front and back doors in the replacement industry today. The other type of safety glass is laminated, which looks much like ordinary glass but has an almost indiscernible tint. The slight tint is the result of the sandwich structure of laminated glass where two layers of 3mm glass are used with a tough plastic interlayer called polyvinyl butyrain (pvb). The combination of the extra thickness, now 6.4mm overall, and the plastic interlayer is what gives it the slight tint. Although laminated glass uses ordinary non toughened annealed glass, when hit hard enough the outer layer of glass may crack, but the broken pieces will adhere firmly to the interlayer, and so stop splinters of glass flying off. This glass is particularly suitable where it is important to ensure the resistance of the whole sheet after breakage such as: shop-fronts, balconies, stair-railings, roof glazing. • PVB laminated glass is two or more sheets of glass which are bonded together with one or more layers (PVB) under heat and pressure to form a single piece. • Resins laminated glass is manufactured by pouring liquid resin into the cavity between two sheets of glass which are held together until the resin cures. 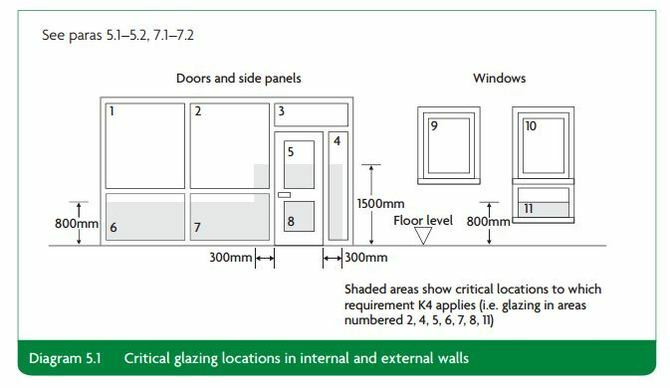 All installed safety glass should be clearly marked with the British Standard test reference BS6206, with the letter L for laminated, and T for toughened, together with the company registration number of the supplier. If you want to identify (older) safety glass that may not have been marked at the time there are some tests which will give an indication, but I would stress should not be relied upon as being definite, and these are: Toughened – look at the glass carefully side on, a distortion, not too dissimilar in looks to sheet glass, should be noticeable where the glass has been heated and cooled. Also with toughed glass the gas marks will be noticeable when looked at through polarised sunglasses NOT ordinary sunglasses. With Laminated, the only real test is an accurate measurement, which should show up a thickness of 6.4mm and not 6mm as with ordinary float glass. Marking of Installed Safety Glass. All glass installed in critical locations (see earlier diagram) should be marked to comply with regulations. If no mark is evident, it is behind the bead or it is blurred then it does not comply and must be replaced immediately.